Over the last 19 years, we have developed a great working relationship with Concern Worldwide based on collaboration, open mindedness and trust. Our goal every time we design an Annual Report for Concern is to ensure that it delivers more than a simple presentation of the organisation’s transparent activities and accounts for the previous year. The Report must speak to stakeholders, donors and policymakers in a fresh, unique and appropriate way – without being ostentatious. Working with Concern as long as we have has led to a great working relationship – but that’s not to say there’s any scope for repetition. 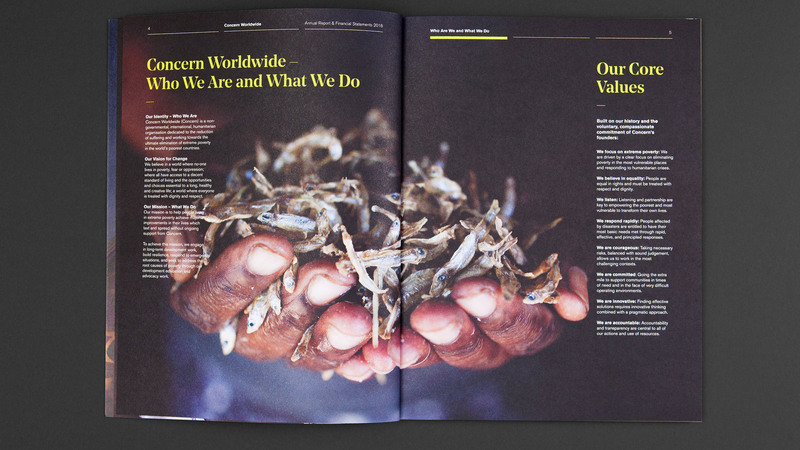 Instead the challenge is to design Concern Worldwide’s Annual Report so that it’s as fresh and engaging to a reader who’s never seen one as to someone who’s familiar with each previous report. During 2016 Concern Worldwide reached over 22 million people in 27 of the poorest countries in the world. The organisation faced many global challenges, including the devastating effects of on-going war in Syria and famine in East Africa. 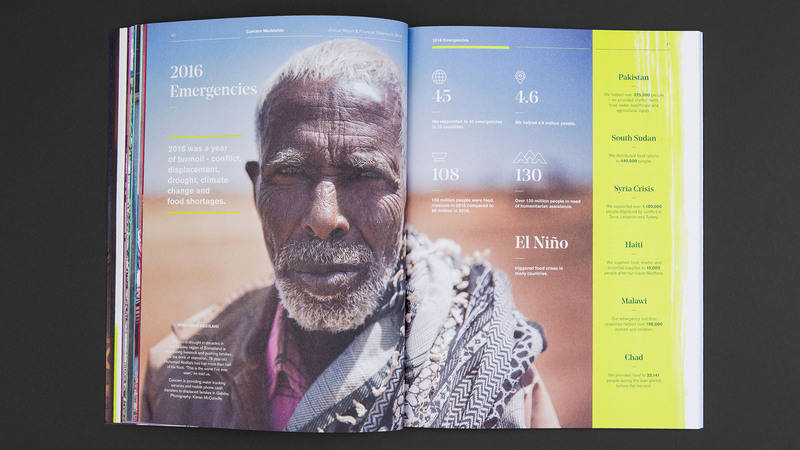 We designed the 2016 Annual Report to demonstrate that Concern has continued to build their capacity to provide larger, better and faster emergency response, directly around the world. To convey a sense of urgency, we introduced a bright fluorescent green and graphic brush-like device to highlight key information. Elsewhere, the bright pop of colour supports the rich selection of photography featured in the report. The Fluorescent green has also been used to good effect in the financial statements to highlight 2016 figures. The double page section dividers have been designed to complement the featured supporting portraits. 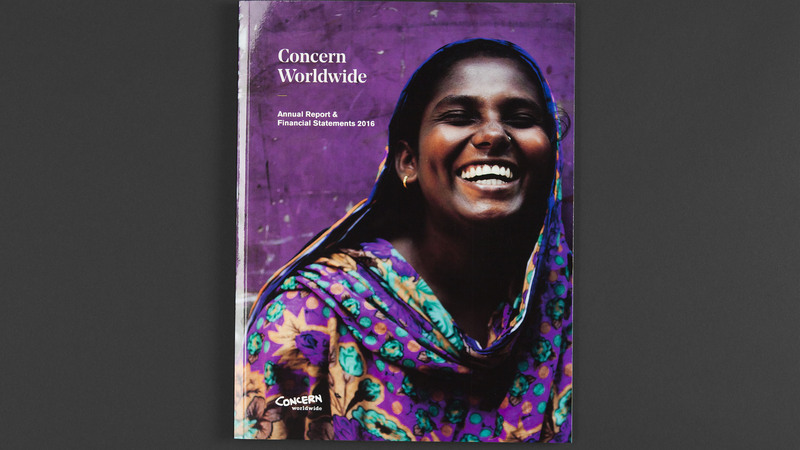 The front cover has a high gloss finish that contrasts beautifully with the uncoated finish internal layout, allowing the striking portrait of one of Concern’s beneficiaries – Fatema from Bangladesh – to stand out.